AND, He will be forever. When thou art present all blessings are mine. Today, you may not be aware of your need for help, so you might bow your knee before your Maker and consider what this self-reliance might reveal. For the rest of us, though, we come clinging to Him. And, as this Psalm (and prayer) suggests, we can rely on Him to help. Would you pray that God’s help would come to me in these days? My 12/29/13AM sermon, Blessed Devotion from Isaiah 58:1-14, is now online. The sermon sought to unpack what true devotion to God looks like by pointing to hearts and lives that are humbled before Him. I hope this sermon is helpful as we reconsider priorities for the New Year. Have a great week. I really enjoy reading Tabletalk, the devotional magazine of Ligonier Ministries. 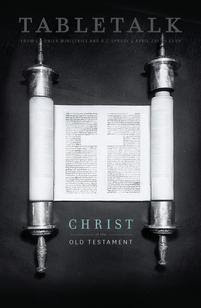 As you can see from the picture to the left, this month’s magazine is on Christ in the Old Testament and features articles from Sproul, Piper, Mohler, and Elyse Fitzpatrick, among others (many of which can be read online). Tabletalk has a Bible reading plan, which I have used in the past. But, I really appreciate the day by day Bible lessons through books of the Bible each month. I think you would appreciate them as well. Tabletalk’s daily Bible studies offer structure for your devotional life. Bringing the best in biblical scholarship together with down-to-earth writing, Tabletalk helps you understand the Bible and apply it to daily living. Readers find Tabletalk approachable and inviting, with many saying it’s like having coffee each morning with their favorite teachers. Its compact size means it fits right in your Bible. …found in this helpful post from Bob Hostetler. If you’re like me, you want to pray for your kids. You know that God has to work in them or there really isn’t much hope. You want Him to do His work. You just start rehearsing the same old things. These 31 ways would be a different thing you could emphasize each day of the month. I use Google Calendar to remind me of Psalms of the Day, Scripture memory for the week and could easily incorporate this. Also, Andrew Case’s book Setting Their Hope in God is helpful for me these days in praying for my children. Whatever you use, though, Pray! The word of God is full of Christ. He is the Sun of this divine system, the Fountain of its light and beauty. Every doctrine derives its substance from His person, every precept its force from His work, every promise its sweetness from His love. Is it not to be feared, that in the study of the Scriptures it is a much-forgotten truth that they testify of Jesus? Are they not read, searched, and examined, with a mind too little intent upon adding to its wealth by an increased knowledge of His person, and character, and work? And thus it is we lower the character of the Bible. We may read it as a mere uninspired record; we may study it as a book of human literature. Its antiquity may interest us, its history may inform us, its philosophy may instruct us, its poetry may charm us; and thus, while skimming the surface of this Book of books, the glorious Christ, who is its substance, its subject, its sweetness, its worth- and but for whom there had been no Bible- has been deeply and darkly veiled from the eye. But it is the office of the blessed and eternal Spirit to unfold, and so to glorify, Jesus in the Word. All that we spiritually and savingly learn of Him, through this revealed medium, is by the sole teaching of the Holy Spirit, opening up this word to the mind. He shows how all the luminous lines of Scripture truth emanate from, return to, and center in, Christ- how all the doctrines set forth the glory of His person, how all the promises are written in His heart’s blood, and how all the precepts are embodied in His life. I hope your heart is warmed by these thoughts and drawn to love Jesus more and more. In a recent commentary, John Piper calls us to a diligent intake of God’s Word which engage the heart and which spring from a head that is delving into deep truth. The main driving force of both is that unless we are deepening our roots in understanding God’s Word our hearts will grow stale and our minds will grow stagnant. Good words indeed. Christ the King Presbyterian Church in Raleigh, NC has provided this helpful devotional in the celebration of Advent.